Coming from a tablet user for the past 10+ years, I can tell you that this Microsoft Courier idea, if it works, would surely be one of the hottest thing to come but given Microsoft’s past track record, especially with their half heart support for OneNote and other Tablet devices and associated softwares…… I don’t know. I surely hope it will be different this time around. Guess only time will tell. Extracted from my CNET Asia Blog Article of the same name. Last week, I was asked to test drive the all new SanDisk Extreme Pro CompactFlash Card, thanks to the guys at TEXT100 HKG (great PR firm in Hong Kong). As an amateur photographer, by no means would I pass on checking out how fast this new memory card claims, that being 90MB/sec. Well, I put it up for some home-made testing of mine to check it out. I conducted a few read and write tests and I used the older generation SanDisk Extreme IV and the SanDisk Extreme FireWire Reader to benchmark the results. Not bad for writing speed. In fact, this new Extreme Pro is whopping fast. Given the price and the storage size (64GB being the highest), it is the ultimate dream card when it comes to taking large picture file size and large video files. Looking at the read and write tests results, one might ask shouldn’t the more expensive Extreme Pro be a lot faster than the old Extreme IV? The answer is yes, the faster Extreme Pro do read and write faster but in order to see the results, it does depends on what kind of card reader you are using. SanDisk can roll out even more faster cards but they do need a fast reader as well. The 45MB/s FireWire Reader from SanDisk surely cannot catch up anymore. SanDisk, hope you dig this. One of my reader, David Golden, sent me an email pointing out the the card performance is most likely optimized for high performance burst mode as your statistics indicate. The sustained write performance (copying 12 GB of data to the card) is not nearly as important. Thanks David for your input. Lightroom 2.5 includes a correction to the demosaic algorithms for Bayer sensor cameras with unequal green response. Videos on the talks at BarCamp Hong Kong is up, go to this blip TV link to check it out. Click pic for more information, registration start at noon tomorrow, hurry up, only 300 slots. Extracted from my CNET Community Blog under the same title, link here. 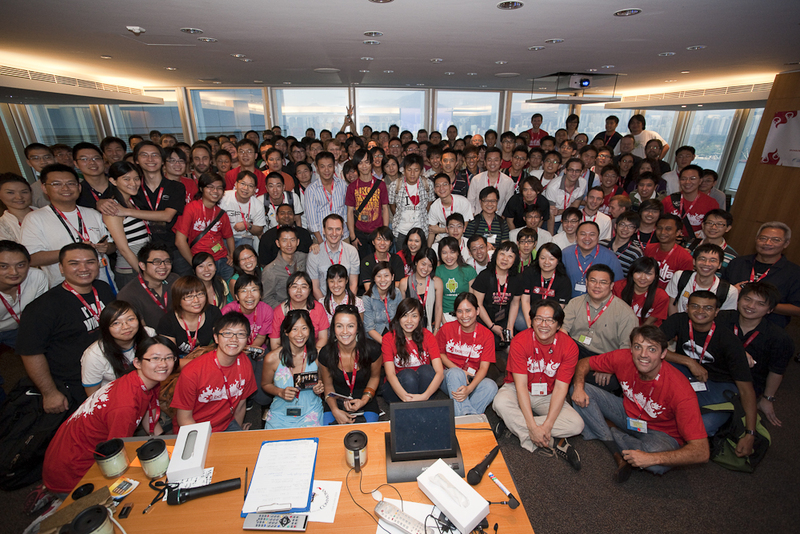 Mark your calendar, BarCamp Hong Kong and Testival Hong Kong 2009 is back. For this year’s BarCamp, the date is set for September 12, 2009, at Turner International Asia Pacific, 30/F, Oxford House, Taikoo Place, Quarry Bay, Hong Kong, from 9.30am to 5pm. Better yet, there will be a after-event drink function at East End Brewery, 23-27 Tong Chong Street, Quarry Bay, Hong Kong. According to the organizers, it is expecting over 300 people at the full-day event, hosted at Oxford House in Taikoo Place, on the conference floor of Turner International Asia Pacific, owner of Cartoon Networks and CNN News. The venue features five large conference rooms, two lounge areas, a coffee room and a bar. Food, drinks and free Wi-Fi will be provided. For more information, check out the BarCamp Hong Kong 2009’s homepage at http://barcamp.hk/ or join its FaceBook group at http://www.facebook.com/home.php?ref=home#/group.php?gid=6146785447&ref=ts. On the same night, the No. 1 Twitterer In Hong Kong, Jay Oatway, will be organizing the second Twestival. On September 12, the Twitter community worldwide is again going to work for charities, this time focusing on their own home towns. In February, Hong Kong participated with 180+ cities worldwide for the first-ever Global Twitter Fundraiser. They had 67 people turn up that night, and they raised enough money worldwide to give clean water to more than 16,000 desperate people. It is bigger the second time around! Tweet your friends and family now @twestivalHK. CNET Asia Community Blog Entry – Apple iTunes Finally Let You Sync Music Between Computers – yay or nay? My new entry over at CNET Asia Community Blog is up. This week’s entry, “Apple iTunes Finally Let You Sync Music Between Computers – yay or nay?”. Click here for the full read. There are currently two versions out, the Professional version (US$19.99) and the Lite version (US$1.99). The Lite version only support the basic functions such as connecting to host computer, firing the camera, seeing post-view image, checking battery status and image remaining. For another US$18, you’ll get all those fancy functions such as being able to adjust shutter speed, ISO, white-balance, exposure compensation, auto exposure bracketing, burst mode and more. For more information (and there are tons), visit onOne Software’s product page. Seems like the prices of the imported version went up the past couple weeks and the prices for the local version have dipped a bit. [2 July 2009] Been getting a lot of queries regarding the street price of the Nokia N97 in Hong Kong. Here’s what I found out so far on the best deals for both the import and local versions. Will update more along the way. This month’s feature – an interview with Hong Kong’s leading Twitter Star, Jay Oatway, the face behind @jayoatway, @portension, @chargedmobi, and lead organiser of Twestival Hong Kong (@twestivalhk) and meet some unusual local proponents of Twitter, the microblogging phenomenon that in the past 12 months has grown from 2 million to 40 million users! Well, ordered my copy of Mac OSX Snow Leopard at the Apple Store, due to limited stock, delivery been pushed back to 7 September. Will check out and see how these two OS fair against each other.